Gauer’s adept background when dealing with custom fabricated products, has earned the company its prominent reputation in the industries Gauer serves. On a recent project, Gauer manufactured some of their traditional Flo-Rak carton flow shelving for a distributor. 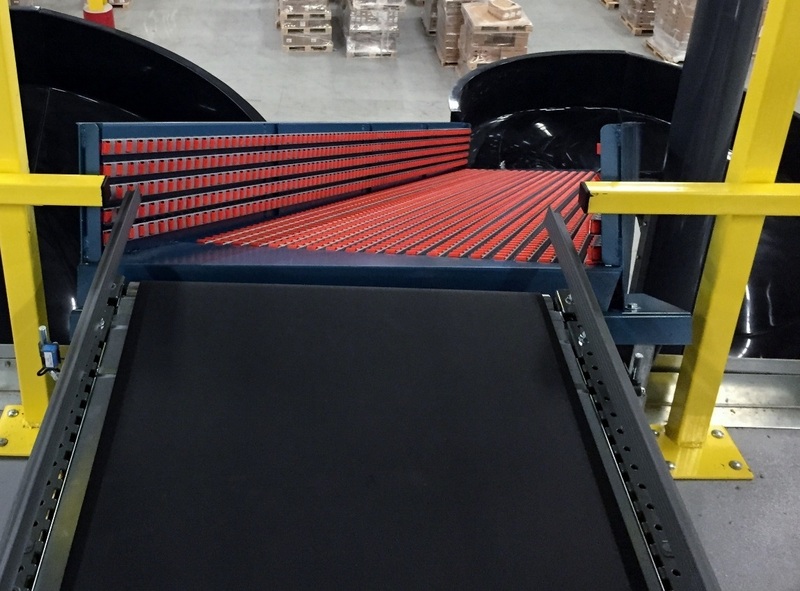 While the warehouse integration was being outfitted, there was a “hang up” issue with the transition between a belt conveyor and a spiral chute. This changeover issue affected several conveyors and chutes of various distances and angles of transition. Gauer’s skills were called upon to fix the issue. Gauer and their customer had less than two weeks to design, manufacture and install these new transition chutes. Gauer’s (R1) Flo-Trak seemed most suited to fix the issue. Working off of some pictures and some pretty accurate step files, Gauer’s engineers were able to design these various transition chutes to create the proper transition angles for the conveyor and chute locations. These designs were added to the customer’s layout in their original step file. After everything was approved by the end user and integrator, Gauer began production. Gauer pushed the manufacturing of the project through the plant as quickly as they could, to eliminate any delays in distribution center’s operation. This was not an easy task because of the strict angles of transition needed to allow the transition chutes to meet up properly with the spiral chutes. In some cases, these spiral chutes were 12 feet away from the conveyor and mezzanine. This project required quick work from some of Gauer’s best press brake mechanics to ensure proper fitting parts, as well as well proper fixturing of the weldments to ensure a good final product. When the first truckload of transition chutes shipped the first transition chute was installed and fit perfectly. The new Gauer chute fit into the transition area better than the original chute that was designed with the system. Upon the installation of the 2nd chute the crane broke down. After the loss of a few hours, the crane was back up and running and more chutes were installed. Gauer got the 2nd truckload of chutes out to the site and the new transition sections worked well, and the DC was back on schedule. This type of dedication to meeting customers’ needs is typical of the Gauer team. Gauer’s experienced staff will be there for their customers when they need it most.